After anxiously awaiting over 2 months, the Naked Blonde Ale (an American Blonde Ale with a high proportion of Simpsons Golden Naked Oats) has completed fermentation and bottled-conditioning. Starting at 1.046, using US-05, this ale finished fermentation down to 1.009, attenuating over 80% (this was due to low mash temperatures). Fermenting around 68 F, the US-05 showed typical characteristics of West-coast ale strains, taking close to a month for the yeast to drop. After primary, I transfer this batch to bottle (as I normally do), primed with 66 grams of corn sugar, yielding 24 bottles (remember, this is small batch brewing). Since this is a light, sessionable ale, I plan to drink this one fresh, and keep a few around to see how the flavors change over time, specifically the flavors and aromas of the Golden Oats. 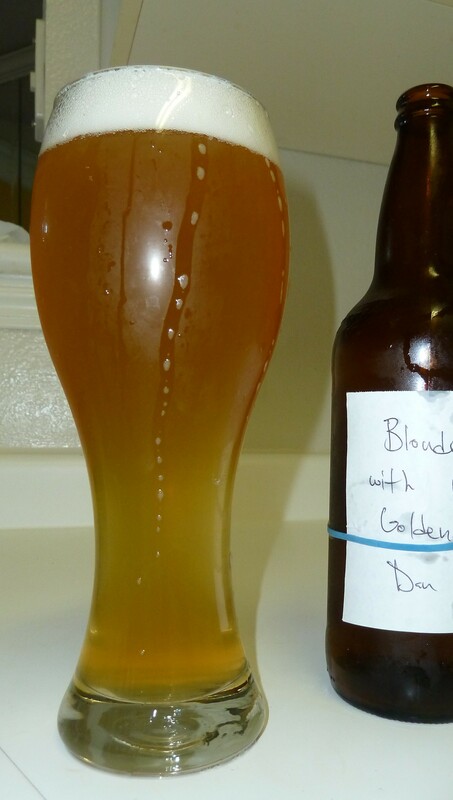 Appearance Pouring into a 22 oz weizen glass, the Naked Blonde Ale has a light golden color, only slightly darker than a blonde with only pale malts, since the Golden Oats contribute some extra color (~8L). 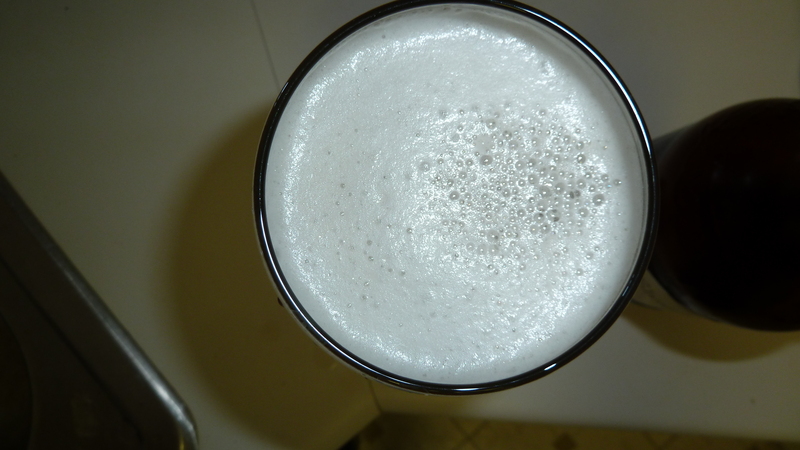 Also, the head from a standard pour was white in color with a very creamy, smooth texture as seen in stouts (the head stayed to the last drop). Aroma In sniffing this beer, the aroma was surprisingly complex compared to a standard blonde ale. Loads of malt with toast and nut, mixed with hints of seedy berries. Very much like jam and toast. Some faint hops are present from a late addition, but this tends to mingle with the malts. Taste Very similar to the aroma in this one. More of the malt with nutty overtones, along with some berry fruitiness. Surprisingly pronounced hop bitterness (perhaps from finishing low?) which nicely balances out all of the malt presence. Mouthfeel For a blonde ale, the Naked Blonde Ale has a big mouthfeel, coming from the large addition of oats. No oiliness from the oats was present (a plus). Good, medium-high carbonation cuts through some of the chewiness of the malt and adds a bit of acidity, making this brew more sessionable. Opinion The sensory characteristics of the Golden Naked Oats are very apparent when placed into a basic blonde ale grist. Blonde ales are typically on the bland/boring spectrum of interesting beers but make up for it in great refreshing/sessionable qualities (don’t take me as a hater of blonde ale…nothing better on a hot 100+ F day). Given this, those oats really shined through with a nutty/berry aroma and flavors, and smooth/big mouthfeel. From these results, I would not disagree with previous reviews of this grain, and highly recommend this recipe to anyone looking to understand the flavor and aroma contributions of Golden Naked Oats in a beer. That being said, I would not probably make this recipe again on experiment grounds (there are more interesting/sessionable beers to make than this one). In small percentages, I think this malts would lend a subtle nuttiness to any beer style, and possibly a good substitute for flaked oats, victory and biscuit malts. For future use of Golden Naked Oats, I would consider using them in a the darker of styles such as browns ales (both American and English), brown porter, etc. Overall, I think the Naked Blonde Ale was a success, and gave me a firm metric on which to base future recipe design with Golden Naked Oats. It will be interesting to see how this one ages, noting how the flavors from the oats change over time. Check out the attached brewer notes for my specific brew day info. Cheers!